breaking with tradition, Union finance minister Jaswant Singh chose not to conform to the two-part format while delivering his maiden budget speech on February 28. But there was no departure from practice in this year's Union budget as it was at the end of the day another populist document. No sign of long-term planning or any strategy beyond the coming fiscal. The welcome provisions were few and far between (see box: The right move). Singh did list out the government's 'Panch priorities': poverty eradication, infrastructure development, tax reforms, agriculture and irrigation, and the manufacturing sector. But, as Shreekant Gupta of the Delhi School of Economics says, a "much more pro-active and holistic approach is needed", and ad-hoc measures will not help. The budget was presented against the backdrop of the severe drought in several parts of the country, the upcoming polls and the standoff in Iraq. Not surprisingly, drought proofing has emerged as one of its salient features. Under this, precision farming (which uses the best available technologies to tailor soil and crop management) and hi-tech interventions (including drip irrigation) are set to be promoted. A total of Rs 50 crore has been allocated for the scheme. The drawback is that the budgetary provisions on drip irrigation provide only a broad outline, says Apoorva Oza, the head of the Aga Khan Rural Support Programme, an Ahmedabad-based non-governmental organisation. Though Singh described agriculture as the "life blood of our economy", he made no mention of crop diversification -- particularly into oilseeds and pulses. Horticulture products have been propped up in the budget. They, however, have a short shelf life and would only create a glut in the market. Instead, an attempt should have been made to break the rice-wheat-rice cycle of cropping pattern. The central budget, opines economist Abhijit Sen, can in any case do very little for agriculture since it is a state subject. The hike in fertiliser issue price has predictably let loose a volley of reactions. While it has gone up by Rs 12 per 50 kilogramme bag for urea, it has increased by Rs 10 for both di-ammonium phosphate and muriate of potash. This, the finance minister said, was done in view of the likely increase of naphtha and gas feed stock. Opposing the hike and calling for a rollback, Union agriculture minister Ajit Singh has termed it "improper and inappropriate, especially when farmers have been badly affected by the severe drought". On the other hand, agriculture economists and scientists have welcomed the move on the ground that urea is being overused at present. They contend that this is affecting soil quality. "The marginal hike in prices will probably cut down the use of urea," says Pramod Kumar of the National Council for Applied Economic Research. Eminent agriculture scientist M S Swaminathan feels that the finance minister should follow up his action by utilising the funds so generated in order to launch a soil health enhancement movement. On an average the government bears a subsidy of about Rs 4,100 per tonne of urea sold to farmers. A minor ripple was set off in the automobile sector as Singh reduced the excise duty on cars from 32 per cent to 24 per cent, perhaps to encourage ownership of private vehicles. But K P Nyati, head of the environment unit of Confederation of Indian Industry is of the view that "public transport should instead by made cheaper so that there is an incentive for not using your private cars". Pankaj Gupta, senior director, Society of Indian Automobile Manufacturers puts a poser: "Why is the government not using a vast range of fiscal measures to combat vehicular pollution?" The proposal to reduce the duty on electric vehicles from 16 per cent to eight per cent "on environmental considerations" has been lauded. Gupta says the cost of clean vehicles is high and hence there are few takers for them. In this context, the reduction in excise duty on electric vehicles is an important step. As against last year's budget, in which the price of diesel was cut, the finance ministry has levied an additional 50 paise per litre cess on diesel and motor spirit. This money would be made available for rural road development. While this is being seen as a positive move, the environmental cost of constructing roads in villages is substantial. On the research front, the Council for Scientific and Industrial Research (csir) has, for the first time, been given a sum of Rs 20 crore to carry out research in solar energy, wind turbines and hydrogen fuel. O P Aggarwal, head of research planning and business development in csir, says such "focused" schemes will prompt the organisation to look beyond a few individual projects. Despite the claims of being one of the largest producers of renewable energy sources in the world, India spends very little on actual research and development in this field. This allocation is separate from that made for the ministry of non-conventional energy sources, which remains unchanged this year. 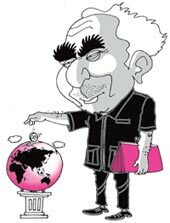 All in all, Jaswant Singh appears to have dished out a populist budget that has been calibrated for the ensuing elections. Expectedly, it falls woefully short of establishing a roadmap for the future -- especially in areas that have a direct bearing on people's lives. Does the government need a greater wake-up call than last year's drought? With inputs from Neelam Singh, Chirag Shah, Rukhsan Bose, Sutapa Ghosh and T V Jayan.